Politicians may be keen to measure schools' effectiveness, but the quality of the school environment is only half of the story, researchers have found. Academics at King's College London's Institute of Psychiatry say the genetic factors children bring to the classroom are just as influential. In a study of 4,000 sets of UK twins, nature and nurture was found to have an equal effect on their achievements. Researchers say this strengthens the case for personalised learning. 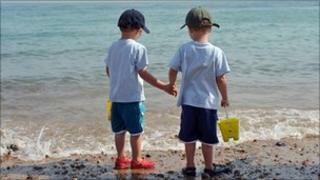 The researchers examined the test results of 12-year-old twins - identical and fraternal - in English, maths and science. They found the identical twins, who share their genetic make-up, did more similarly in the tests than the fraternal twins, who share half their genetic make-up. The report said: "The results were striking, indicating that even when previous achievement and a child's general cognitive ability are both removed, the residual achievement measure is still significantly influenced by genetic factors." The study says the findings point to a need to re-examine what schools, colleges and universities offer young people, particularly in the light of modern technology. It says: "Instead of thinking about education as a way of countering genetic differences among children, the field of education might profit from accepting that children differ genetically in how much they learn. "This way of thinking is compatible with the current trend towards personalising education by optimising children's learning, which is increasingly possible through the use of interactive information technology." The report concludes: "More generally, instead of thinking about education as instruction (from the Latin instruo, which means 'to build in'), this genetic perspective on learning suggests a return to the original meaning of education (from the Latin educatio, which means 'to draw out'). "That is, instead of a model of instruction in which children are the passive recipients of knowledge, a genetically sensitive approach to education suggests an active view of learning in which children select, modify and create their own education in part on the basis of their genetic propensities." The lead researcher, geneticist Dr Claire Haworth, said taking a genetic perspective on education meant moving away from the notion of children being "passive recipients" of knowledge. Instead, children should be seen as active participants who "select, modify and create" their own education - in part on the basis of their genetic propensities. "These findings do not mean that educational quality is unimportant, in fact environmental factors were just as important as genetic factors," said Dr Haworth. "However, these results do suggest that children bring characteristics to the classroom that influence how well they will take advantage of the quality. "Consider a classroom full of students being taught by the same teacher - some children will improve more than other children, even though their educational experience at school is the same."